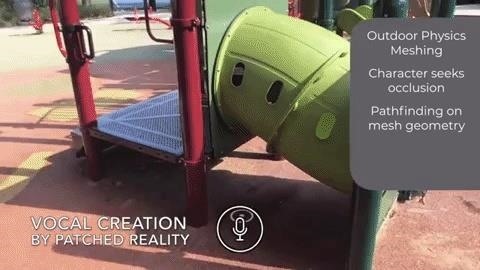 A sizzle role just released by the augmented reality cloud company 6D.ai shows what hyperrealistic AR experiences developers can create with their SDK. For the upcoming Dragon Duel game, developer Happy Giant developed an AR Dragon that can climb real world objects and run behind them to get virtual items. From Miletwo comes Li Dirt Bikers, a team of virtual miniature racers who can drive over actual obstacles. Last but not least, Vocal Creation comes from Patched Reality, a prototype app that can conjure AR content based on voice commands. Say "Rabbit" and a cute bunny appears, then say "clover" and a piece of plant appears that the bunny can eat. The furry friend can climb down the stairs and climb up on playground equipment. It can also respond to commands, eg. For example, hide behind physical objects or disappear into a hole when saying goodbye. These experiences and more come to us as part of the 6Demo God Challenge, which 6D.ai has set up as a platform for private beta participants to showcase their AR prototypes. 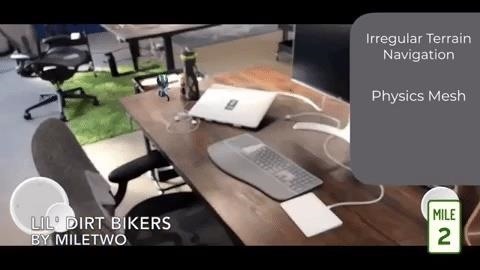 The platform creates a real-time 3D network of physical environments with just a smartphone camera and dispenses with the depth sensors HoloLens, Magic Leap One and other AR headsets use similar Results. With this understanding of the environment, mobile AR apps can take advantage of and surpass features such as real-world occlusion, persistent content, and hassle-free multiplayer experiences, which ARKit and ARCore currently offer. In addition to Contestants, 6D.ai, have found a hands-on application in the hands of designer Weirdcore, who uses the platform in the music video for Aphex Twins "T69 Collapse". Opening the platform brings 6D.ai one step ahead of other well-founded AR Cloud provi such as Niantic and Ubiquity6. Overall, these platforms not only enable a more immersive and realistic AR experience for mobile apps, but also provide the opportunity for smart glass manufacturers to build future wearables that sacrifice depth sensors and enable them to achieve product designs with leaner form factors.